On 6 May 2013 Tony Lovick got on his bike to participate in the Norwich Cycle Swarm to raise money for Operation Orphan. 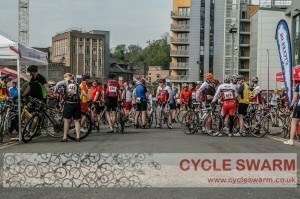 It was a beautiful day and Tony joined over 500 other cyclists along the 35 mile route. He completed it in 3 hours 45 minutes (including a 45 minute lunch break!). In his words ‘nothing earth shattering’ but I reckon a pretty good go, it’s certainly faster than I could have done it! Tony also looked into a match funding scheme at Towers Watson and found that they would match funding given to any charity by their employees. So by combining physical effort with generosity and some ingenuity Tony raised a huge £1100! Thank you so much for your enterprising thinking and your support.